The strategy might be unorthodox, but opposing managers may want to consider pitching around Brandon Nimmo when the bases are loaded. The Mets' No. 4 prospect capped a career-high six-RBI night with his second grand slam of the season Friday as short-season Brooklyn cruised to a 12-4 triumph over Tri-City. Nimmo finished with three hits, singling twice and driving in a pair of runs before his final at-bat. With the Cyclones leading, 8-4, the 2011 first-round Draft pick pulled a pitch from Travis Ballew over the right-field wall at Joseph L. Bruno Stadium. "I was just trying to keep things simple, staying with the fastball and get good pitches to hit," Nimmo said. "It just worked out that I got hold of some balls in good situations. And this game is really just centimeters that separate the good nights from the bad. I'm just enjoying the moment because they don't come around often." Nimmo is the only player in the New York-Penn League with two grand slams this season. His first homer of the year was a grand slam, and the Wyoming native is 4-for-9 with 12 RBIs with the bases full. It's a situation he relishes. "You could say that," Nimmo said. "It just happens that I got a hold of two balls in those situations. Obviously, an athlete likes to be in big situations. I enjoy batting with that situation -- a lot of great things can happen." After batting .200 in the opening month of the season, Nimmo has turned things around. The 19-year-old outfielder is batting .282 with four homers and and is tied for seventh in the league with 31 RBIs, despite spending most of the summer batting in one of the two top spots in the lineup. Nimmo also ranks third with 33 walks and seventh with a .400 on-base percentage. "I think I just finally realized how to take pressure off myself," he said of his turnaround. "I think that first month, even when I didn't know it, subliminally I was putting pressure on myself with expectations. Now I've been trying to hit the ball hard and not worry about base hits and just worry about hitting the ball hard and worrying about what I can control." Playing in a league that's often filled with players from college programs, Nimmo is pleased with how his year has gone. "I got off to a slow start, and to be doing well now, I couldn't be happier," he said. "I'm really happy with how I've dealt with the adversity because I haven't really had to deal with that too much. Dealing with adversity and doing that while going through a long grind of the season since I've been playing ball since February. ... I really am happy about how this season has gone." 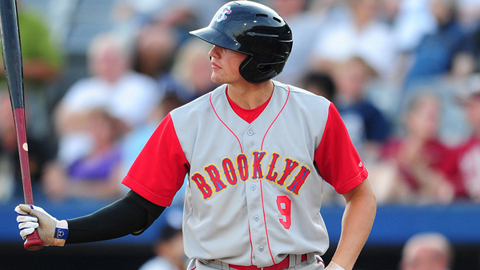 Phillip Evans reached base three times and scored twice for Brooklyn, which got a pair of hits from Eudy Pena. Cyclones starter Gabriel Ynoa improved to 5-1 after allowing a run and scattering eight hits over five innings. The New York-Penn League All-Star struck out five.